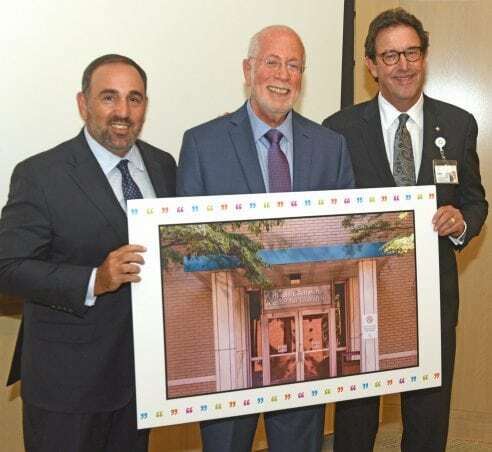 The Institute of Living (IOL) Commons Building will be named after Harold (Hank) Schwartz, MD, whose legacy includes transforming the IOL into what it is today and the recognition he has brought it across the state and nation. Dr. Schwartz, affectionately known as Hank, is stepping down as Psychiatrist-in-Chief on Oct. 1, although he will continue seeing patients, mentoring, researching and writing on the IOL campus for at least the next two years. He is being replaced by John Santopietro, MD, DFAPA, who has been named Hartford HealthCare (HHC) Behavioral Health Network Physician-in-Chief. The building, which also houses the Myths, Minds and Medicine museum, will be renamed the Harold I. Schwartz Center for Education. Hartford HealthCare Senior Vice President and Behavioral Health Network President Pat Rehmer, who worked for Schwartz for years at the IOL before taking on the job of commissioner of the state Department of Mental Health and Addiction Services (DMHAS), described Hank as a mentor. Even when she worked with the state, she would reach out to Dr. Schwartz occasionally. “I was surrounding by really smart people, but sometimes I just felt I needed to speak with someone just little bit smarter,” she said. She also described a moment following the Sandy Hook massacre, when DMHAS was the lead agency at the scene. Hartford Hospital President Bimal Patel praised Dr. Schwartz for his leadership, conviction and “bold execution.” He told a story about a suicidal patient that Dr. Schwartz has refused to discharge, defying the order of the probate court because he believed the patient would immediately kill himself and Schwartz was threatened with contempt of court by the patient’s attorney. Dr. Schwartz was in Vermont at the time, but when contacted by Patel about the patient he said he would drive back and tie himself to the patient and would be willing to go to jail for contempt of court. In the end, the patient remained at the IOL until hospitalization was no longer required. IOL Interim Medical Director Joanna Fogg-Waberski, MD, said Dr. Schwartz could assess patients like no other psychiatrist she has ever met. She also praised him for his public speaking, whether in the media, in clinical forums or the national stage. Adrienne Bentman, MD, IOL Director of Residency Training, praised Dr. Schwartz for being consistent and direct, and for never giving up his commitment and compassion to care for the extraordinarily sick individuals that the IOL sees. “You provide the support for us to bear that burden,” she said, adding that she served with Dr. Schwartz on the Sandy Hook Commission, and although he was not the chairman, he was the driving force to get things done. Al Herzog, MD, an IOL Psychiatrist who has known Dr. Schwartz for approximately 30 years, joked that at one time he did Dr. Schwartz’s performance evaluations and then Dr. Schwartz did his. But throughout, they remained friends. He praised his colleague for his energy, integrity and courage. “You almost single-handedly brought the IOL back to national prominence,” he said. HHC President Elliot Joseph used the word human-ness to describe Dr. Schwartz.